PHOENIX — Arizona Governor Doug Ducey weighed in on the Hacienda Healthcare investigation involving an incapacitated woman who was allegedly raped by one of her caretakers, Nathan Sutherland. In a series of tweets published Friday morning, the governor called for the termination of senior leadership at the healthcare facility. "The senior leadership in that enterprise needs to be completely replaced," Ducey wrote. "That includes the Board of Directors, every one of whom should be terminated immediately." He also stated he has "zero confidence" in the facility's leadership. "My confidence level in that institution and its leadership is zero, and our job now is to ensure that the individuals in their facilities are safe," Ducey continued. 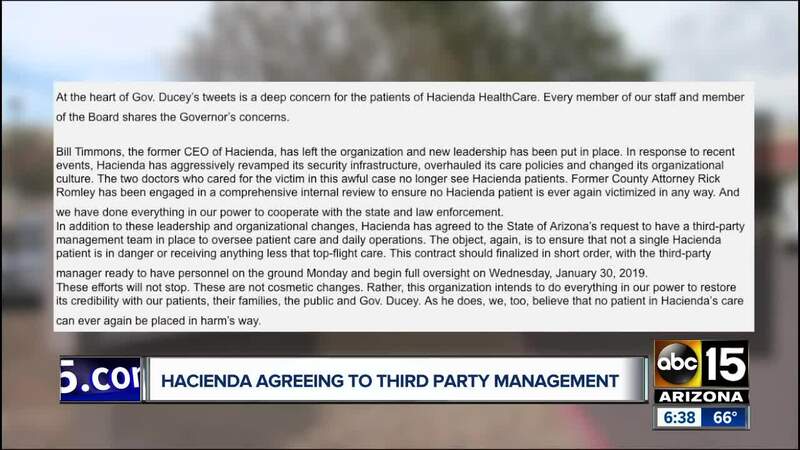 In response to the governor's tweets, Hacienda HealthCare stated they have agreed to the State of Arizona's "request to have a third-party management team in place to oversee patient care and daily operations." The third-party managers should begin full oversight Wednesday, January 30, 2019, according to Hacienda HealthCare. "At the heart of Gov. Ducey's tweets is a deep concern for the patients of Hacienda HealthCare. Every member of our staff and member of the Board shares the Governor's concerns. Bill Timmons, the former CEO of Hacienda, has left the organization and new leadership has been put in place. In response to recent events, Hacienda has aggressively revamped its security infrastructure, overhauled its care policies and changed its organizational culture. The two doctors who cared for the victim in this awful case no longer see Hacienda patients. Former County Attorney Rick Romley has been engaged in a comprehensive internal review to ensure no Hacienda patient is ever again victimized in any way. And we have done everything in our power to cooperate with the state and law enforcement. In addition to these leadership and organizational changes, Hacienda has agreed to the State of Arizona's request to have a third-party management team in place to oversee patient care and daily operations. The object, again, is to ensure that not a single Hacienda patient is in danger or receiving anything less that top-flight care. This contract should finalized in short order, with the third-party manager ready to have personnel on the ground Monday and begin full oversight on Wednesday, January 30, 2019. These efforts will not stop. These are not cosmetic changes. Rather, this organization intends to do everything in our power to restore its credibility with our patients, their families, the public and Gov. Ducey. As he does, we, too, believe that no patient in Hacienda's care can ever again be placed in harm's way."